Overuse injuries may represent as much of a problem as do acute injuries in many sports. This paper reviews key concepts related to the methodology for recording overuse symptoms. Results from the FIVB Volleyball Injury Study were used to compare two different recording methods. The aim of this paper was to provide recommendations on how standardised methodology can be developed to quantify overuse injuries in surveillance studies. Using beach volleyball data, a “traditional” cohort study approach using a time-loss injury definition suggested that injury risk was very low. In contrast, the data from a survey of past and present pain problems in the shoulder, knees and low back demonstrated that these were prevalent. The following recommendations are made: (1) studies should be prospective, with continuous or serial measurements of symptoms; (2) valid and sensitive scoring instruments need to be developed to measure pain and other relevant symptoms; (3) prevalence and not incidence should be used to report injury risk; (4) severity should be measured based on functional level and not time loss from sports. In conclusion, new approaches are needed to develop more appropriate methodology to quantify overuse injuries in studies. The first step in the sequence of sports injury prevention research, as outlined by van Mechelen et al in 1992,1 is to describe the magnitude of the problem in terms of the frequency and severity of injuries. Typically, a cohort study is used, where a number of teams or athletes are followed prospectively for one season or longer. The second step is to map the causes of injuries, to identify their risk factors and mechanisms. Risk factors are typically also examined in cohort studies, where the characteristics of injured athletes can be compared with athletes without injury.2 The final step in the injury prevention sequence is to introduce measures that are likely to reduce the future risk and/or severity of sports injuries and document whether they are effective. From an epidemiological standpoint it is ideal to evaluate preventive measures via a randomised controlled trial. In the consensus document, an injury was defined as “any physical complaint sustained by a player that results from a football match or football training, irrespective of the need for medical attention or time loss from football activities.”3 An injury that results in a player receiving medical attention is referred to as a “medical attention” injury, and an injury that results in a player being unable to take a full part in future football training or match play as a “time loss” injury.3 It is important to recognise that the consensus paper provides not one but three different injury definitions: “any physical complaint,” “medical attention injury” and “time loss injury.” The choice of injury definition will influence the rate of injury reported in studies, as players will not always seek medical attention for physical complaints, and even fewer cases will result in time-loss injuries. Therefore, it should be expected that a “physical complaint” definition will yield a higher injury rate than a “medical attention” definition, and with a “time loss” definition resulting in the lowest rate. The 2006 consensus document appears to have been generally accepted, and the definitions and principles outlined are in widespread use in many different sports, judging from the more than 70 citations the paper has received already. In reviewing these papers, it appears that—of the three injury definitions outlined in the consensus paper—the time-loss definition is the one most commonly used, almost without exception. There are probably several reasons for this. One is, as recognised in the consensus paper, that variations in medical support may create differences in the incidence of injury reported between studies. Physical complaints are common among athletes, and unless someone is available to examine athletes on a daily basis, many will go unrecorded. The medical attention definition is of course also highly dependent on the availability of medical support. Using the time-loss definition permits comparison of data at different levels of performance, as injuries can be recorded based on attendance records kept by the coach, a parent or even the players themselves. Second, some would argue that the time-loss definition captures the most relevant injuries, those that directly influence the ability to take part in practice and games. The design of a typical cohort study, where injuries and their severity are recorded based on player attendance, is shown in fig 1. 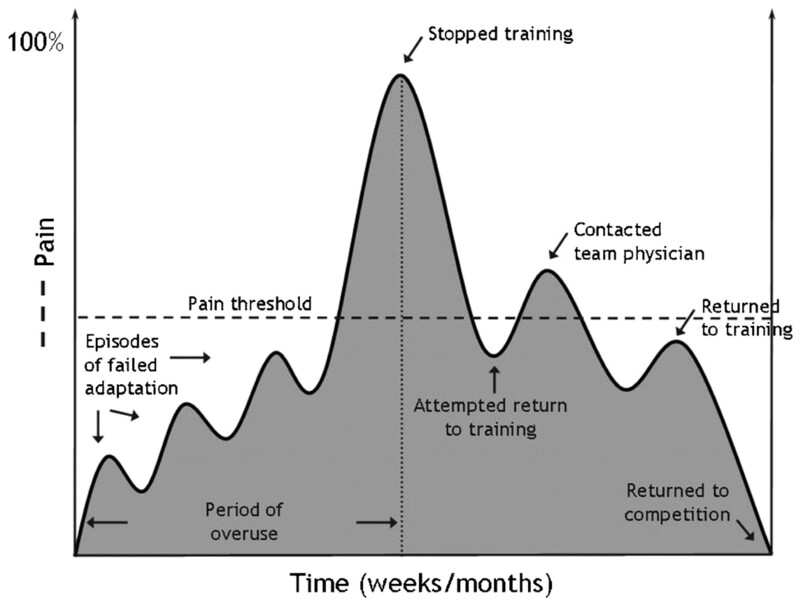 Example of a typical prospective cohort study design based on the time-loss definition, where 12 athletes have been followed for one season, suffering a total of eight injuries. 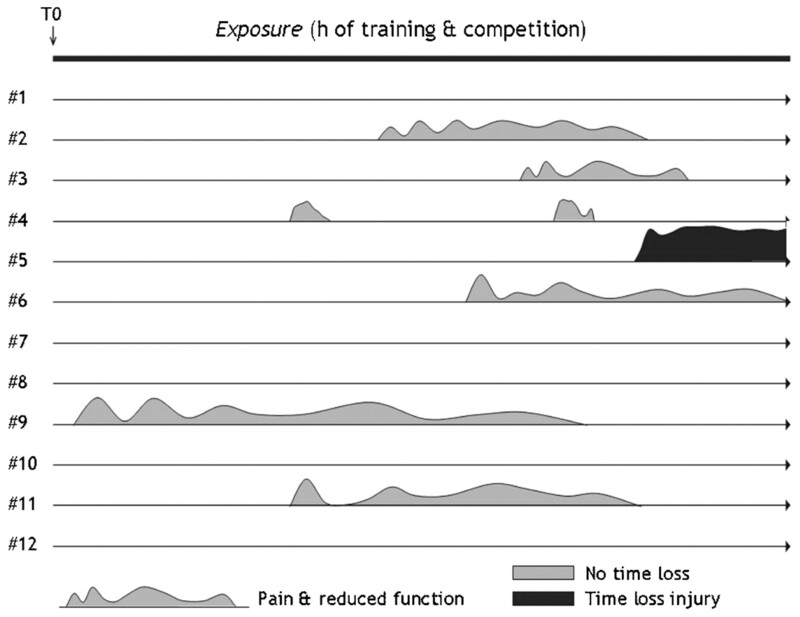 The incidence of time-loss injuries can be calculated based on training and competition exposure, and the severity of each injury can be classified according to the duration of the time-loss period. The same principles are commonly employed in risk factor studies and intervention studies. One question which follows from this is how appropriate this methodology is if it is applied to sports with few acute, traumatic injuries but a preponderance of overuse injuries. In the 2006 consensus statement, a traumatic injury was defined as an injury resulting from a specific, identifiable event, and an overuse injury as one caused by repeated microtrauma without a single, identifiable event responsible for the injury.3 Others have included the term gradual onset in the definition of an overuse injury. In most cases, it is easy to classify an injury as acute or overuse, but in some cases it may be less obvious. This is particularly true when the symptoms have a sudden onset, although the injury may actually be the result of a long-term process. For example, an athlete with a stress fracture in the foot will often report that the symptoms originated during a specific run, perhaps even from a specific step. This means that the injury could be classified as an acute injury. Nevertheless, the actual cause of the stress fracture is overuse over time. These types of injuries should be classified as overuse injuries. As illustrated in fig 2, the pathological process is often under way for a period of time before the athlete notices the symptoms. It is believed that repetitive low-grade forces exceeding the tolerance of the tissues cause overuse injuries. In most cases, the tissue will repair without demonstrable clinical symptoms. However, if this process continues, the ability of the tissue to repair and adapt can be exceeded, resulting in a clinical overuse injury with symptoms. Note that although, in this example, the athlete did stop training and consulted the team physician, this is not always the case. Many overuse injuries are therefore not captured if a time-loss definition is used to record injuries. Hypothetical overview of the onset of tissue injury and pain in a typical overuse injury. Adapted from Leadbetter WB. Cell-matrix response in tendon injury. Clin Sports Med 1992;11:533–78. Acute injuries are most common in sports in which the speed is high, and the risk of falling is great (eg, downhill skiing), and in team sports where there is much contact between players (eg, soccer and rugby union). Overuse injuries make up a large portion of injuries in aerobic sports that require long training sessions with a monotonous routine (eg, long-distance running, bicycling or cross-country skiing). But a large number of overuse injuries also occur in technical sports, in which the same movement is repeated numerous times (eg, tennis, javelin throwing, weightlifting and high jumping). However, the guidelines outlined in the consensus documents3 4 were developed for football and rugby union; the question is how appropriate the recommendations are when applied to aerobic or technical sports where overuse injuries may be expected to dominate. A hypothetical scenario is shown in fig 3. This illustrates how—if a time loss injury definition is used—the injury rate may be recorded as low, despite a high prevalence of overuse injuries causing significant pain and reduced function. Hypothetical example of results from a prospective cohort study on symptoms of pain and reduced function among 12 athletes followed for one season. Although a total of eight episodes with significant symptoms can be observed, only one of these would have been detected if a time loss definition of injury had been used. Thus, we compared the results from two different recording methods, one “traditional” injury registration using a time-loss injury definition and one survey of past and present pain problems in the shoulder, low back and knees (see box 1 for details on the data-collection methods). The aim of this paper is to (1) review common definitions used in sports injury research, (2) highlight the need to define overuse injuries differently from acute injuries for surveillance purposes and (3) provide ideas and recommendations on how standardised methodology can be developed to quantify overuse injuries in surveillance studies. The example of beach volleyball is used, but the principles apply to any sport where overuse injuries are common. A total of 26 time-loss injuries were reported during the 8-week competition period. Of these, 14 were acute injuries and 11 overuse injuries (one other; neck pain). Of the 115 players interviewed, 23 (20%) reported one or more time-loss injuries during this period, 13 for acute injuries and 10 for overuse injuries. The incidence of acute time-loss injuries was 4.1 (SE 1.3) per 1000 competition hours and 0.5 (0.2) per 1000 training hours. The injury rate was higher during matches than during training (relative risk: 9.0; p<0.001), but there was no gender difference in total injury rate, nor for beach volleyball competition or training, warm-up or other training. Of the 26 time-loss injuries, knee injuries (n = 5, 36%) were the most common acute injuries and shoulder injuries (n = 5, 42%) the most common overuse injuries. 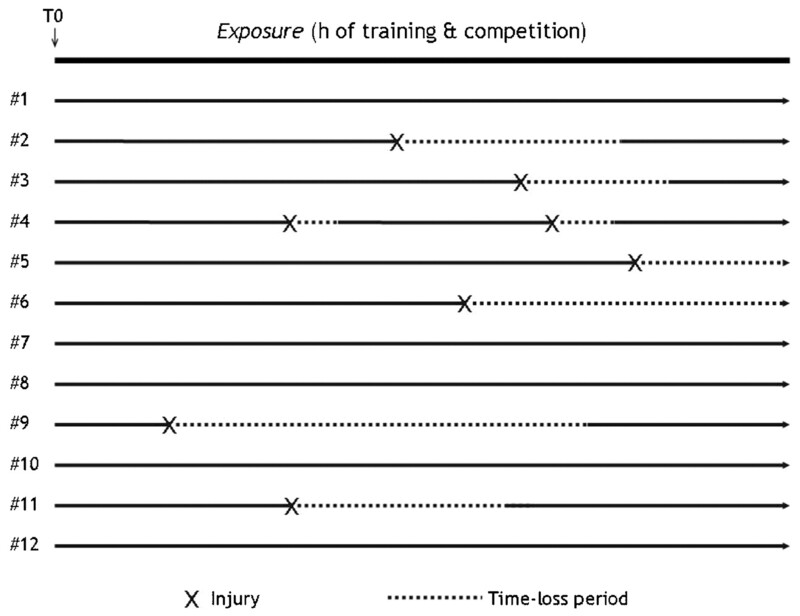 The severity of the time-loss injuries reported was mild, as judged by the duration of absence from match/training. Only two injuries (one acute and one overuse) resulted in an absence of more than 3 weeks, four injuries resulted in 8–21 days of absence, four injuries resulted in 4–7 days and the majority, 16 injuries, resulted in 1–3 days of time loss. The distribution of responses to the questionnaire about low back, shoulder and knee pain is detailed in table 1. The results show that as many as one-third of the players reported symptoms from at least one region during the previous 7 days, and up to one half during the previous 2 months. When they were asked to rate their pain level on a 10 cm visual analogy scale, players who had experienced pain problems during the previous 2 months rated their current pain level while playing volleyball at 2.4 (SD 2.0) for the low back and 3.7 (2.1) for the shoulder. Players reporting to have had symptoms of jumper’s knee during the past 2 months reported their current VISA score at 77 (18). Despite this, few players reported to have missed training altogether, and even fewer reported having missed tournaments during the same period (table 1). A total of 56 players (49%) reported pain problems from one region (low back, shoulder or knees) during the past 2 months, 32 players (28%) from two regions and seven players (6%) from all three regions (fig 4). Only 20 players (17%) reported no pain problems from any of these three regions during the previous 2 months. For the past 7 days, 48 players (42%) reported pain problems from one region, 22 players (19%) from two regions and four players (3%) from all three regions (fig 4), while 41 players (36%) reported no pain from any of these three regions during the previous week. 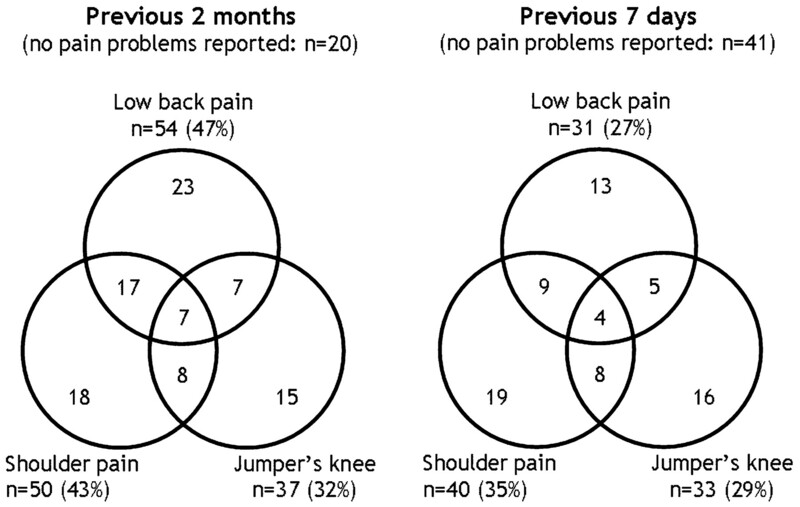 Venn diagrams depicting the number of players reporting pain problems in each of the three regions during the previous 2 months (left panel) and 7 days (right panel). Comparing data from the two different recording methods; no injuries but plenty of pain? As expected, the data show that the injury definition and data-collection method used play important roles in determining the magnitude of injuries in a technical sport such as beach volleyball. A tentative conclusion based on the “traditional” cohort study approach using a time-loss injury definition would be that the injury risk is very low. In contrast, the data from the survey suggest that pain problems are prevalent, predominantly resulting from overuse injuries in the shoulder, knees and low back. In contrast, the pain survey revealed that players reported a host of pain problems related to the low back, knees or dominant shoulder. In fact, more than a third of the players reported pain problems from at least two regions during the previous 2 months. Only 17% of players reported having experienced no pain problems from any of the three regions during the previous 2 months; the corresponding figure for the past 7 days was also low, only 36% (fig 4). Despite this, few players reported to have missed training or competition during the study period, and very few overuse injuries were also identified in the injury registration which caused more than a few days of time loss. In most cases, the pain levels reported were moderate, 2.4 for the low back and 3.7 for the shoulder on a 0–10 visual analogue scale. The pain survey represents a fundamentally different approach to the injury registration, in that players are asked to recall pain problems, regardless of their effect on participation and performance. This can be likened to the “any physical complaint” definition from the 2006 consensus paper. However, it should be noted that the questions were limited to “pain, ache or soreness;” other functional limitations which could represent a physical complaint were not recorded. The questionnaires were limited to three locations predicted to cause problems in this group of athletes, that is the low back, shoulder and knees. These regions were identified based on clinical experience as well as the 2001 FIVB Injury Study, where overuse injuries were reported mainly from these three regions.6 Questions relating to other regions, such as fingers, elbow, the cervical spine or other knee problems than those caused by jumper’s knee, would probably have resulted in some, albeit fewer problems reported than for the main predilection sites among volleyball players. Another fundamental difference between the beach volleyball study and most previous studies is that the present study focused on symptoms, and not on identifying specific injuries. In fact, the underlying diagnosis was not known, except for knee problems, which was limited to those caused by jumper’s knee. One consequence is that we do not necessarily know that the symptoms result from overuse injuries; low back pain is common in the non-athletic population, as well. The same limitations apply to the pain survey as the injury registration, recall and selection biases. Recall bias—especially related to the 12- and 2-month questions—can be expected to be higher than for time-loss injuries. Players with overuse problems may have been less likely to enter the Gstaad tournament than the previous tournaments on the tour. The Gstaad event was the last tournament before the Olympic Games but did not count towards the Olympic ranking, which may have led some to stay home to rehab before the Beijing Games. In other words, as for the time-loss injuries, the data presented on pain problems can be expected to represent minimum estimates. Another limitation of the pain survey is that there are no validated instruments for the specific purpose of evaluating the level of physical complaints among athletes. We used a questionnaire which was originally developed to study the prevalence of occupational musculoskeletal symptoms14 15 and later adapted to study the prevalence of low back pain among athletes.16 We then used the same questions to assess shoulder and knee pain. However, these are not designed to measure functional limitations experienced by the players; nor are they able to capture the level of pain players have experienced over the course of a season. The exception may be the VISA form, which does measure pain levels during several different functional tasks and to a certain extent also detects limited performance among players who are still competing and training. Despite these limitations, it appears safe to conclude that the injury definition and data-collection methods are critically important in determining the magnitude of injuries in a surveillance study. Using a “traditional” cohort study approach with a time-loss injury definition, it seems that the injury risk in beach volleyball is very low, while the pain survey suggests that most players are affected by pain problems from overuse injuries in the shoulder, knees or low back. Based on our experience from beach volleyball, it seems clear that a novel approach is needed to be able to quantify the problem of overuse injuries among athletes. This is particularly important in sports where overuse injuries are expected to dominate, that is aerobic sports and technical sports, if we are to present a valid representation of the injury problem. However, it is also possible that the magnitude of overuse injuries and complaints in high-speed and contact sports is underestimated when the traditional methodology with a time-loss definition is used to record injuries. The following recommendations are made. In the example from beach volleyball, the prevalence of pain problems was measured retrospectively in active players during one specific event. A similar approach has been used in previous cross-sectional studies.10 16 The main limitations of this approach have been addressed above, mainly recall and selection biases. To minimise these, we suggest that a prospective study design is used as illustrated in fig 5, following a predefined group of athletes with serial measurements of symptoms and function. Ideally, symptoms should be monitored continuously, but in most cases this is not possible for practical reasons. A more realistic approach is to assess the current level of symptoms at regular intervals—for example, once a week or once a month. The frequency would depend on how much symptoms are expected to fluctuate and the duration and size of the study. The same principles should be applied not just in phase 1 studies on injury magnitude, but also in cohort studies on risk factors and intervention studies. Note that if the symptoms recorded are prevalent in the general population it may be necessary to include non-athletic or other relevant control groups in studies. Otherwise, it will not be possible to attribute the symptoms observed to athletic participation. Schematic of possible prospective cohort study to assess physical complaints in a cohort of athletes. The vertical dotted lines and arrows denote periodical surveys where each athlete scores his level of pain problems, functional limitations and any performance effects from overuse injuries. The objective is to detect what is referred to as “any physical complaint” that results from sports participation. Pain may be regarded as the main symptom of overuse injuries. However, pain is not the only symptom, and other domains of impairment and disability should be included if the goal is to describe the consequences experienced by the athlete. Depending on the injury location, other problems could include swelling, instability, reduced strength, limited range of motion, reduced agility and other functional limitations affecting athletic performance. In health research, questionnaires have been developed to measure health-related quality of life using multidimensional outcome measures that include domains of physical, mental and social health and measures of function and disability. For example, a variety of different joint-specific scoring instruments have been developed for the knee (eg, the Knee injury and Osteoarthritis Outcome Score (KOOS),17 International Knee Documentation Committee (IKDC),18 the shoulder (eg, Constant Murley Score (CMS),19 American Shoulder and Elbow Surgeons evaluation form (ASES)20 and a number of other joints and regions. However, most scoring instruments have been developed to assess treatment outcomes in non-athletic patient populations. Although they may have been shown to be valid, reproducible and sensitive in this setting, their use cannot necessarily be extended to the monitoring of overuse injuries in athletes. It is likely that new instruments need to be developed for this specific purpose. Whether these need to be specific to each region or joint remains to be seen, perhaps it will be possible to develop general scoring instruments to measure the level of pain and functional limitations experienced by athletes. Regardless, scoring instruments should be completed by the athletes themselves, and developing internet-based solutions and perhaps even methods based on text messaging could make it easier and more convenient to participate in studies. The “traditional” measure of injury risk is incidence, the number of new cases during a specific period of exposure. However, overuse injuries and pain problems such as low back pain and jumper’s knee are often chronic, with periods of remission and exacerbation. For example, Lian et al10 showed that 44% of volleyball players were affected by jumper’s knee. However, their data also showed that the average duration of symptoms for athletes with jumper’s knee was 32 months, and only 25% had developed the condition during the same season. Therefore, prevalence, the proportion of athletes affected by problems at any given time, is a more appropriate measure of the magnitude of injuries than incidence. With serial measurements, it should be possible to report, for example, average values over the course of the season and even compare different stages of the season. As illustrated by the beach volleyball data presented above, the duration of time loss from sports is not an appropriate measure of injury severity. If valid and sensitive scoring instruments can be developed, it should be possible to express the functional level or performance limitation of an athlete in relation to full function. For example, although the limitations of the VISA score have been addressed above, this scoring instrument is an example of how function can be scored from 100% to 0%. It should be noted that there are no fundamental differences between these recommendations and those presented in the consensus statement on injury recording in football.3 Rather, the present guidelines represent an extension of these, with a particular focus on how these could be applied when the purpose is to study overuse injuries in sports. In conclusion, new evidence suggests that overuse injuries may represent as much of a problem in many sports as do acute injuries. New approaches are needed to develop more appropriate methodology to quantify overuse injuries in studies across all phases of injury prevention research. The data were collected as part of the FIVB Injury Study II during the FIVB World Tour Grand Slam tournament in Gstaad, Switzerland from 21 July to 27 July 2008. The first part of the study consisted of a retrospective registration of all injuries incurred from 26 May to 20 July, that is until the start of the event in Gstaad. The second part of the study consisted of a self-completion survey covering past and present pain problems to the low back, shoulder and knees. The players were informed about the purposes and requirements of participation in the study during the technical meeting, which all the teams were required to attend. They were invited to contact the research group for a 15–20 min interview at a time suitable for them, and they were informed that participation was voluntary. They were also assured that the information provided could not be traced back to the individual, team or country. Care was taken not to disturb the athletes in their preparation for matches or during recovery. Among the 128 players qualified for the main draw, a total of 115 players consented to take part in the study (58 of 64 female players and 57 of 64 male players; overall response rate 90%). The format of the retrospective injury registration was personal interviews with the players, where they were first asked to recall their exposure during the previous 2-month period (all tournaments played and training volume, beach volleyball and fitness training) based on a structured form based on the week-by-week competition calendar for the World Tour season for men and women, respectively. They were then interviewed about any new or recurrent injuries identified during this period. The injury registration period covered 8 weeks of training and competition. During this period, seven tournaments for women and men were held on the World Tour, and players may also have participated in other national or regional tournaments. The World Tour tournaments were formatted either as a 32-team double elimination bracket or with an initial pool play phase followed by a single elimination bracket. A team could play between two and eight matches in the main tournament each week. In addition, before the main draw of each tournament a 2-day qualification tournament was played in which 30–50 teams competed for eight spots in the main draw. The average duration of matches as recorded on the score sheets from the FIVB World Tour tournaments in question was 50 min for men and 44 min for women (range 28 to 93 min). The injury definition used for this part of the study was “any injury causing cessation of the athlete’s participation in competition or training for at least 1 day following the onset of injury.” For each injury the player had sustained, the following information was collected: (1) type of activity (whether the injury occurred in a match, during warm-up for a match, during beach volleyball training, or during strength training or other conditioning training); (2) whether it was an acute injury (with a sudden onset) or an overuse injury (with a gradual onset); (3) injury type (concussion, contusion, sprain, strain, tendinopathy, dislocation, fracture, skin wound, other); and (4) injured body region. Also, the time to return to play was recorded as the time it took until the athlete was fully able to participate in matches and comply with all instructions given by the coach during training. Exposure was recorded retrospectively for each week, including the number of matches played (including qualification matches for a World Tour event main draw, or participation in other non-World Tour events), the number of hours of beach volleyball training and other forms of training (strength and conditioning). The total exposure was estimated based on the average match duration on the World Tour (see above) at 2422 h of competition and 8710 h of training. The second part of the study was a self-completion questionnaire focusing on overuse problems in the low back, dominant shoulder and knees (jumper’s knee, patellar tendinopathy). The questionnaire was developed form a previous study on low back pain problems in rowing, orienteering and cross-country skiing based on standardised Nordic questionnaires that had been developed and validated to study the prevalence of occupational musculoskeletal symptoms.14 15 This questionnaire includes questions on low back pain (defined as “pain, ache or soreness in the low back, with or without radiating pain to the gluteal area or the lower extremity”). The form also includes a full-figure outline of the posterior body where the low back was shown as a hatched area covering the lumbar region. Based on this form, similar questionnaires were developed asking about shoulder pain (defined as “pain, ache or soreness in the dominant shoulder, with or without radiating pain to the upper extremity”) and knee pain (defined as “pain, ache or soreness in the quadriceps and/or patellar tendon”). In other words, each player completed three similar questionnaires, one for each region. The definitions of low back and shoulder pain were shown prominently on the first page of each questionnaire, while the concept of patellar/quadriceps tendon pain was explained by pointing to and palpating the relevant tendon regions before the athletes began completing the questionnaires. Have you experienced low back/shoulder/knee pain during the previous 2 months? Have you experienced low back/shoulder/knee pain during the previous 7 days? How many days of training have you missed because of low back/shoulder/knee pain during the past 12 months? How many tournaments have you missed because of low back/shoulder/knee pain during the past month? Do you currently take pain killers or anti-inflammatory medication when you play because of shoulder pain? If you do have shoulder pain while playing, how intense is the pain usually? Please indicate by placing X on the line below (10 cm visual analogue scale from “No pain” (0) to “Worst pain possible” (10)0. I am indebted to WW Briner Jr and MA Bahr, for their collaboration in the FIVB Volleyball Injury Study II, to the FIVB, for financial support, and to FIVB staff and officials, for practical support during all phases of the study.
. Consensus statement on injury definitions and data collection procedures for studies of injuries in rugby union. Br J Sports Med 2007;41:328–31.
. A framework for recording recurrences, reinjuries, and exacerbations in injury surveillance. Clin J Sport Med 2007;17:197–200.
. Prevalence of jumper’s knee among elite athletes from different sports: A cross-sectional study. Am J Sports Med 2005;33:561–7.
. Recording injuries among elite skiers and snowboarders—a methodological study. Scand J Med Sci Sports. In press.
. Validation of injury surveillance in male professional football. Scand J Med Sci Sports. In press.
. Prevention of sports injuries. In: Kjaer M, ed. Scandinavian textbook of sports medicine. Copenhagen: Munksgaard, 2002:299–314.
. Nordiska frågeformulär för kartleggning av yrkesrelaterade muskuloskeletala besvär. Nord Med 1984;99:54–5.
. Standardised Nordic questionnaires for the analysis of musculoskeletal symptoms. Appl Ergon 1987;18:233–7.
. Low back pain among endurance athletes with and without specific back loading—a cross-sectional survey of cross-country skiers, rowers, orienteerers, and nonathletic controls. Spine 2004;29:449–54.
. Knee Injury and Osteoarthritis Outcome Score (KOOS)—development of a self-administered outcome measure. J Orthop Sports Phys Ther 1998;28:88–96.
. Development and validation of the international knee documentation committee subjective knee form. Am J Sports Med 2001;29:600–13.
. A clinical method of functional assessment of the shoulder. Clin Orthop Relat Res 1987;214:160–4.
. A standardized method for assessment of elbow function. Research Committee, American Shoulder and Elbow Surgeons. J Shoulder Elbow Surg 1999;8:351–4.
. The VISA score: an index of severity of symptoms in patients with jumper’s knee (patellar tendinosis). Victorian Institute of Sport Tendon Study Group. J Sci Med Sport 1998;1:22–8. Funding The Oslo Sports Trauma Research Center has been established at the Norwegian School of Sport Sciences through generous grants from the Royal Norwegian Ministry of Culture, the Eastern Norway Regional Health Authority, Norsk Tipping AS and the Norwegian Olympic Committee & Confederation of Sport.